TIC Ruffec came into being some twenty years ago. French owned and run, the agency built up an excellent reputation locally and also with British clients. Mike and Christophe, who were employed as agents, took over the agency in May 2010, after the longstanding owners decided to sell. Mike, who's Scottish, and Christophe, who's half French and half English, feel that their experience gives them extra insights into what British clients really need. Mike explained that TIC Ruffec's excellent reputation has been built on an ethos of honesty and professionalism. The region of Poitou-Charentes is popular with British buyers, thanks to the lovely countryside, accessibility and low property prices. But, this has led to a proliferation of estate agencies hurriedly set up, hoping to make a fast buck without offering a knowledgeable and professional service. In contrast, Mike and Christophe take a truly honest approach. Clients can rest assured that all properties have not only been visited and assessed by the team, but will also be realistically described and priced. If you contact TIC Ruffec, you won't be wasting time viewing properties that don't meet your criteria. The thriving little market town of Ruffec, in the Charente department, is the central point for TIC Ruffec. The agency covers an area radiating out for approximately 30 kilometres from the town, taking them into the North Charente, South Vienne and South Deux-Sèvres. Ruffec is a natural point of focus as it offers excellent amenities along with plenty of old French character. And, all around it is glorious Charentaise countryside of golden sunflowers, rolling terrain and woodlands. Add to this the air, rail and road links offered by Poitiers, La Rochelle, Limoges and Bordeaux, and it's hardly surprising that Ruffec appeals to so many property seekers. When you're looking for a property in France, you want to work with an agent who really knows and understands the area and its property market. That's why TIC Ruffec keeps it local, dealing only with properties that their agents can personally visit. The agency's team members (owners Mike and Christophe, secretary Tiphaine and agents Nathalie, Andy and Sarah) all live within the area they cover. So, they know the towns and villages they show you. They know the correct prices for the properties too. You won't find falsely inflated prices on their books - they simply won't accept them. TIC Ruffec won't take you to properties without telling you the bad news as well as the good. If a property that meets all your criteria happens to be beside a busy road, or within touching distance of wind turbines, Mike, Christophe and the team will make you aware of it so you can make an informed decision to visit or not. It's all part of the service, and prevents time wasting and nasty surprises for all concerned. However, as Mike relates, it isn't always possible to rule out surprises! During a viewing one summer, the client asked how close the neighbouring property was. They peeked over the boundary fence to check. The neighbour, a gentleman, was peacefully cleaning his swimming pool while soaking up the sun... totally naked! TIC Ruffec's team will help you with every step along the way from finding your dream home to settling into your new life in France. They take pride in their after sales service which includes all the help you'll need until you've established the contacts and confidence to deal with things yourself. They'll arrange changeover of utilities, setting up of bank accounts and help you with translation of letters and documents... all for no added fee. And, they'll do this for as long as you need their help. How's that for service! 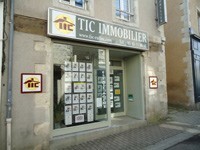 TIC Ruffec advertises its properties with French Property Links. As Mike explained, it's important for an agency to choose only the most effective portals and sites for advertising, as no one has money to waste these days. Internet research showed them that French Property Links gets the best results and brings in plenty of enquiries. The agency also likes the friendly approach and good communication that FPL offers. It's a recipe for success. We used TIC Ruffec in 2004. Mike and the gang saved our bacon because we were being given the runaround by other agents who did not listen to what we wanted. The gite we rented online was disgusting when we arrived and not suitable for a family searching for a house in France. TIC Ruffec found us a lovely place to rent on a farm - the kids loved it, within two days they found our house, helped negotiate a really good price and even now, nine years down the road we know we can ask questions if we need to. They have recently put me in touch with the owner of what will be my new business premises - and it's next door to them. Can't wait to be neighbours. I can honestly say you can't be in better hands, receive a better service or find someone who listens to your needs and then finds a property that ticks all the boxes. WELL DONE THE TIC RUFFEC TEAM.